he OFA would like to thank the following members of the evaluation team for assessing alternative technologies and providing their valuable input. In earlier studies, the OFA examined the opportunities to use biomass as a substitution for coal and natural gas, including a business case for purpose-grown biomass as a combustion fuel and the sustainable harvest of crop residues. 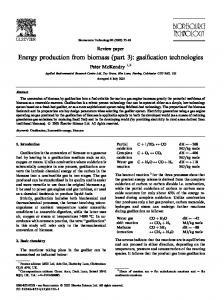 These reports are available on the OFA website along with other biomass studies. Please visit www.ofa.on.ca/issues/overview/biomass to access these previous studies including this report. In order to complete their due diligence on behalf of producers, the OFA placed a high priority on examining all existing technologies as well as promising emerging technologies that could be useful to convert agricultural biomass into electricity, fuel or other forms of energy. Hence, the scope of this study was broadened to look at all pathways leading to energy production. This study represents a significant deviation from previous studies where combustion technologies were examined to produce energy. A worldwide search of emerging commercial technologies resulted in more than 20 different technologies being evaluated by a technical panel. The panel assembled the knowledge and skills from various sources including the research community, the commercial sector and government staff. The OFA wishes to thank those who diligently participated. Based on the information presented, the Report provides useful guidance to the agricultural sector with respect to a greater understanding of the risks and opportunities of each technology. Recommendations on investment opportunities and scenarios will help producers with their individual investment decisions. The report is also unique because a biomass producer, Scott Abercrombie of Gildale Farms, authored a chapter in the Report on harvesting, handling, storage and transportation of biomass materials. The OFA wishes to thank Scott for his important contribution to the study. The OFA would like to thank the Western Sarnia-Lambton Research Park and its authors, Dr. Aung Oo and Dr. Katherine Albion for their thoroughness and dedication in preparing this report. n 2010, the Ontario Federation of Agriculture (OFA) received Agriculture and Agri Food Canada (AAFC) funding through the Canadian Agricultural Adaptation Council (CAAP) to conduct producer level research and value chain determination in support of commercializing agricultural biomass into energy and co-products. his study reviews alternative technologies to transform biomass into energy and coproducts and also examines the applications of these technologies in the agricultural sector in Ontario. The consumption of different types of energy in Ontario agricultural sector is analyzed, and potential energy generation from agricultural biomass is estimated. The alternative technologies to transform biomass into energy and co-products are evaluated for their technical and commercial strengths and suitability for the agricultural sector in Ontario. Biomass harvesting, storage, transportation and handling activities for the bioenergy sector are also discussed. The financial spreadsheet models are developed to estimate the return on investment for the selected technologies. 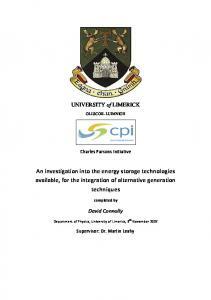 The status of research and development of emerging bio-energy technologies are presented. The segments of the bio-energy value chain are analysed to determine to what extent agricultural producers should participate in the bio-energy industry. produced, can be sustainably harvested annually. An additional 3 million tonne/yr of biomass can be produced by planting purpose-grown crops such as miscanthus and switchgrass on less than 5% of agricultural lands in Ontario. Approximately 30-35% of grain corn grown in Ontario is currently used to produce ethanol. There are about 1.7 million cattle in Ontario (OMAFRA statistics) whose manure waste could be used to produce 1.55 TWh or over 60% of total electricity consumed in the agricultural sector. Approximately 5,500 TJ/yr of electricity could be theoretically generated from manure biogas if all of it were available for digestion facilities. Anaerobic digestion is a mature bio-energy technology at farm scale, ranging from 300 to 3,000 kW of electricity generation capacity. Ontario agricultural producers should participate in the complete value chain of AD bio-energy systems. Farm organization like OFA should lobby for better access to the electricity grid and for a better premium price of energy generated from the AD systems. Pyrolysis, gasification, torrefaction, micro turbines, and small scale energy storage are emerging technologies for agricultural bioenergy generation. More research and development is required, especially using agricultural biomass as feedstock for the commercialization of pyrolysis, gasification and torrefaction. It should be noted that the research and development of emerging bio-energy technologies is not an area of expertise for Ontario producers. If bio-energy systems with these emerging technologies were built in Ontario, agricultural producers should participate in the feedstock supply and biomass transportation of the value chain. Participating in energy production, marketing and selling of the energy and co-products would require further assessment for these technologies on a case-bycase basis. A similar approach could be employed for other emerging bio-energy technologies. recent years. They range from portable biomass pelletizers to mobile pyrolysis units to small biomass gasification systems. These small units can process 1 to 3 tonnes/hr, (fewer than 30,000 tonnes/yr) of raw biomass. In many Ontario counties, approximately 150,000 tonne/yr of biomass can be gathered within 100 km radius. With smaller systems aimed at processing 20 to 30,000 tonnes of biomass annually could be supported locally with favourable economies of scale. Extreme care should be exercised in analyzing the financial feasibility of small scale bio-energy systems. Once the profitability of a small system is proven, there will likely be new larger entrants to the industry with favourable economies of scale. be possible in selected locations. Economies of scale would be an important factor for bioethanol industry, and availability of inexpensive feedstock is critical for bio-diesel industry. Participating in bio-ethanol and bio-diesel industries would provide a reasonable hedging for Ontario producers who consume considerable amounts of liquid fuels in transportation during farming activities. Taking minority stakes or forming joint ventures with financially performing bio-ethanol and bio-diesel manufactures are recommended. The return on equity of most bio-energy systems ranges from 10 to 15%. Current prices for biomass and other energy sources as well as feed-in-tariff rates for electricity from biomass influence the actual return rate on equity for various projects. Generating heat and power from agricultural biomass at large scale would be relatively new for Ontario, and risks associated with bio-energy technologies must be carefully managed. The threat of other energy sources on the bio-energy sector in Ontario is significant. At the current low price of natural gas in Ontario, energy generation using natural gas as a feedstock is very attractive. Also, competition from other biomass resources from the forestry sector and municipal solid wastes should not be underestimated. The financial advantages of a bio-energy system using agricultural biomass should be identified at the feasibility study stage of each project. highlighting the potential socio-economic benefits of responsible bio-energy production to the agricultural and rural sectors. The low price of natural gas and increasing electricity cost in Ontario could result in significant changes in energy consumption mix in the medium to long term timeframe. Further analysis is required to examine these effects on the bio-energy industry. The potential integration of bio-energy facilities with other bio-based industries should also be investigated. 1.1 Ontario Agricultural Sector and Energy Use Ontario is one of the most prominent agricultural provinces and home to approximately 50% of Canada’s agricultural Class 1 land. Ontario is the largest producer of grain corn and soybeans, about 65% and 75% of Canadian total, respectively (Statistics Canada). The agricultural sector is one of the main economic pillars in Ontario, creating jobs in rural areas and in food processing industries. Farming activities consume significant amount of energy, representing about 2% of total energy consumption in Ontario. Table 1.1 lists the consumption of major energy types in the agricultural sector in Ontario. Energy consumption is expressed as biomass equivalent in million tonnes. Ontario farms produce over 50 million tonnes of grains, beans, and feeds annually (OMAFRA crop statistics). iomass is considered a renewable energy source. Farms in Ontario traditionally produce grains, beans and meat for human consumption, feed for livestock, and feedstock for various industries. The agricultural sector can also offer purpose-grown biomass and crop residues to be utilized in generating electricity, heat and other by-products. As a significant consumer of energy products, the agricultural sector could potentially benefit from participating in bio-energy generation. In this chapter, the consumption of different types of fuels in the Ontario agricultural sector is presented. Energy from biomass is compared with other energy sources in the province. Preliminary assessment of alternative technologies to transform agricultural biomass into energy and by-products is discussed. 1.2 Biomass and Competing Energy Sources When electricity generated from biomass is sold to the grid, it entitles the premium price as provided by the FIT program. However, for other forms of final energy such as space heating applications or onsite power generation of own use, biomass has to compete with different energy sources available in Ontario. The estimated cost of different types energy sources are compared with biomass pellets in Figure 1.1. The costs are at consumers’ gate and compared in the unit cost per energy content ($/GJ). The price of energy could fluctuate on a short to medium term time frame; however, prices will likely increase in the long term due to scarcity of energy resources, increasing population and economic activities. Therefore, participating in energy generation would provide a hedge for the Ontario agricultural sector against greater input cost of farming operations resulting from increased energy price. Approximately 30 to 35% of grain corn grown in Ontario is currently used to produce ethanol (Grier et. al, 2012). This allows Ontario agricultural sector participation in transportation liquid fuel energy markets to some extent. However, there is a potential for greater participation in energy markets due to the available biomass resources discussed above. 20 biogas electricity plants in the Ontario agricultural sector based on personal communication with industry experts. There are about 1.7 million cattle in Ontario (OMAFRA statistics), and approximately 5,500 TJ/yr, i.e. 1.55 TWh of electricity could be theoretically generated from manure biogas. This potential manure-based electricity represents about 63% of total electricity consumed in Ontario agricultural sector (see Table 1.1). demand of biomass, replacing heating oil and propane, is approximately 3 million tonnes annually. This demand can be met by crop residues or purpose-grown biomass grown on less than 4% of agricultural land in Ontario. Two noteworthy trends in energy markets in Ontario are the increasing price of electricity and the declining price of natural gas. In the Ontario Long-Term Energy Plan released in 2010, the provincial government stated that residential bills are expected to rise by 3.5 per cent per year, and industrial prices are expected to rise by 2.7 per cent per year over the next 20 years. In the meantime, the price of natural gas has decreased significantly from its peak in 20072008 and is expected to remain at current level due to abundant shale gas discovered in nearby regions. These trends could result in the improved economics of Combined Heat and Power (CHP) using natural gas as a fuel in medium to large industries where there are considerable heat demands. For example, the IGPC Ethanol Inc. is installing such a CHP unit at their plant in Aylmer, Ontario (personal communication with IGPC Ethanol Inc.). Energy contained in biomass can be transformed into heat and/or power through a number of primary conversion technologies and integrated conversion technologies. Primary conversion technologies include anaerobic digestion, direct conversion, gasification and pyrolysis. Integrated conversion technologies include gas-fired boiler, oil-fired boiler, Internal Combustion (IC) engine, indirect fired gas turbine, micro turbine, gas turbine, fuel cell, Stirling engine, heat exchanger, steam turbine and energy storage. Some of the technologies are commercial while some can be considered as emerging technologies. The preliminary assessments of selected alternative technologies to transform biomass into energy are summarized in Table 1.3. Anaerobic Digestion (AD) is a proven commercial technology to convert wet biomass such as manure or municipal green wastes into combustible gases. Integrated conversion technologies listed in Table 1.3 further transform the combustible gases into heat and power. IC engines are the most common integrated conversion technology for the anaerobic digestion system to generate power. The typical electricity generation capacity of AD systems ranges from 250 to 500 kW, and up to 3,000 kW units are commercially available. Indirect fired gas turbines can be also used in the anaerobic digestion power systems; however, they are more costly than IC engines. Gas turbines, micro turbines (which are small gas turbines), and fuel cells require relatively clean gases to operate. Stirling engines have been proven at lab scales; however, extensive commercial use has yet to be confirmed. Heat and power can also be produced by direct combustion of biomass in fixed bed or fluidized bed boilers as the primary conversion integrated with heat exchangers or steam turbines. This energy conversion system has been in commercial operation for decades. Direct combustion steam turbine biomass power generation systems are relatively larger ranging from 10 MW to over 300 MW of electrical power. Co-firing biomass with coal to generate heat and power could have some issues at higher biomass-to-coal ratio since the combustion temperature of coal-fired boilers is higher than the ash melting temperature of biomass causing fouling of boilers. However, the direct combustion systems dedicated to biomass are designed at lower combustion temperatures and operate with no major technical issues. demand is expected to grow significantly over the next decade (Ginther, 2011). Torrefaction technologies are currently in laboratory to pilot scale productions and mostly use forestry biomass. Torrefaction of agricultural biomass is at the laboratory research and development stage at present. In southern Ontario, torrefaction of agricultural biomass could occur at the point of use for small to medium scale applications due to relatively short transportation distance. Bio-based liquid fuels, mainly ethanol and biodiesel, are currently produced in commercial operations. Production of ethanol from starch/sugar crops is a relatively mature technology. However, cellulosic ethanol technologies are at pilot to demonstration stage and have yet to be proven for commercial viability. In 2012, DuPont has started the construction of a commercial scale cellulosic ethanol plant in Iowa. This plant is expected to begin production in mid 2014 using corn crop residues as feedstock. Biodiesel technologies are also commercially proven. At current mandatory blend rates in Ontario, biodiesel plants seem to be financially attractive only if inexpensive feedstock such as used cooking oil or other industrial wastes are available. Both sugar/starch ethanol and bio-diesel technologies are expected to progress gradually in lowering the production costs. The development of cellulosic ethanol technologies should also be monitored since a large quantity of crop residues is available in Ontario. gases could improve the commercial viability of the gasification heat and power systems using agricultural biomass as feedstock. he initial activities relating to biomass conversion include harvesting, storage, and transportation to a processing or conversion facility and material handling to preprocess the biomass to the facility‘s specifications. Agricultural biomass is a low value commodity as compared to grain or forage commodities. Thus, it is important in these initial steps in the biomass supply chain that all efficiencies must be maximized to supply biomass such that both the supply and the conversion of the biomass are economically viable. The objective would be to minimize the number of steps, handling, labour and cost incurred to supply biomass to the conversion facility. At the present time, corn stover residual and purpose grown crops including switchgrass and miscanthus hold the most potential as agricultural biomass feedstock. Thus, these will be the focus of this chapter in the report. that must be considered. For example, balers who produce a round bale are very common. However, round bales are not as efficient for storage, transportation, and handling compared to large square bales, especially high density bales made by newer generation balers capable of chopping the material while baling. High density balers can produce bales with up to 25% greater density, which translates into improved efficiencies for handling, storage, and transport. Additionally, because of the greater density, the bales withstand stacking and handling better than the round bales. Because of the inefficiency of rounds bales, in many cases round bales will not be accepted or face a discriminatory price adjustment at the end conversion facility. Furthermore, round bales may require preprocessing at another location since the equipment to break up round bales is different from square bales and the operation produces considerable dust. Another limitation may be the capacity of smaller or older forage equipment. Newer generation forage equipment such as high density balers or high capacity forage harvesters should require no modifications and only little adjustment to harvest biomass material. While this equipment might be cost prohibitive for producers with small acreage, many custom operators will provide these services cost effectively, especially as this equipment is not likely to be utilized during the timeframe of harvest of the biomass crops. Examples of new generation, high capacity conventional equipment are shown below in Figure 2.1 and Figure 2.2. Several equipment manufacturers offer similar equipment. 2.1.2 Developing Equipment Specific to Biomass In response to the opportunity to harvest corn stover, especially for the ethanol market, several equipment manufacturers have modified combines to harvest both the grain corn and corn stover or corn cobs simultaneously in a one pass operation. Examples of specialized equipment are shown Figure 2.4. 2.1.3 Economic Cost of Harvesting Activities The economic costs of harvesting biomass can be derived using rates for the required harvest activities for custom operators for traditional forage crops and adjusting for differences in yield. The rates used in calculating the harvest costs were taken from the OMFRA Survey of Custom Farm work Rates (http://www.omafra.gov. on.ca/english/busdev/facts/10-049a3.htm). 2.1.3.1 Switchgrass Assuming an average yield of 10.0 DM t/ha, the costs to harvest a switchgrass crop by swathing, raking and bailing and removing the biomass from the field are shown in Table 2.1. Costs for raking are included as it is assumed that the switchgrass is swathed in the fall; thus in the spring prior to bailing raking would likely be required to turn the swaths to help facilitate drying of the biomass. a miscanthus crop. Due to the low density of chopped biomass, the cost in this harvest method is nearly equal between the cutting/chopping operation and removing material from the field. 2.1.3.3 Corn Stover Corn stover collected after the primary grain corn is combined would be harvested by using a stalk chopper to shred the stover, raking into a window and then baling. Costs to harvest corn stover using this approach are shown in Table 2.4 and are based on a yield of 5.0 DMt/ha. This approach would maximize the yield as compared to allowing the combine to discharge the cobs and husks into a windrow and subsequently baling only this biomass. Recently, the University of Illinois has published a calculator to enable producers to calculate the value of their residue crops (http://miscanthus.ebi.berkeley.edu/ Biofuel/CropSelection.aspx and Biomass Magazine, Nov., 2012). As discussed earlier, corn stover may also be harvested in a single pass operation using a specialized combine. At the present time, this method is uncommon in Ontario, but research suggests a theoretical harvest cost of $32/DMt (Shinners et. al, 2003). 2.2 On-Farm Storage Once the biomass is harvested, it must be stored until needed. Conversion facilities will generally only have a working storage representing a small buffer as compared to the total annual processed tonnage. Thus, biomass will likely be stored on farm. This represents a challenge because of the high volume and low bulk density of the biomass. Also, each biomass crop is generally only an annual harvest. Additionally, biomass must be stored in a manner to preserve the quality of the biomass, thereby limiting deterioration. however, there is a much greater potential for increased contamination from dirt picked up the root mass of the stock, mud tramped into the stover from grain harvest equipment, or from dirt that has splashed onto the stover from heavy rainfall. These examples demonstrate the tradeoffs and the quality implications of harvest methods and timing which must be considered. prevent degradation of biomass in storage especially when stored for longer periods. Based on current prices, the application would cost approximately $2.50 per large square bale. 2.2.2 Alternative storage methods Another option for the storage of chopped biomass is to simply pile chopped or bulk biomass in large piles in the field. Generally, the biomass would be left uncovered and exposed to the environment. The top layer of the pile would form a crust and serve as a protective layer, preventing precipitation from reaching the remaining biomass. This storage method would have the most potential for quality degradation and spoilage, with potential negative implications to the conversion process. 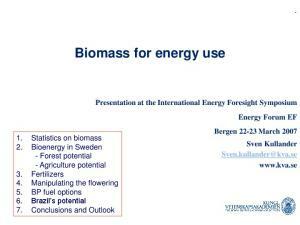 Many other possibilities and opportunities for the storage of biomass crops exist. An innovative idea is to combine a biomass storage facility with a rooftop photovoltaic solar system to maximize the functionality and share capital costs of the structure. 2.2.3 Economics of storage Shown in Table 2.5 are approximated costs for different storage options for biomass. These figures assume that biomass is being stored for one year and includes material, equipment and labour to transfer into and out of storage, and capital costs of equipment and buildings where applicable. For storage using a vertical silo or bunker, no capital costs for the structure are included as it is assumed to be idle otherwise. Cost associated with the actual harvest such as baling or chopping is not included. Note: Cost estimates are for 300-500 tonne of storage capacity. 2.2.4 Risks due to unique biological and material properties of biomass One must consider that biomass, even when dry, is still subject to potential deterioration and dry matter loss from biological processes. Increased moisture content, duration of storage, temperature fluctuations and the amount of biomass stored all negatively impact the potential for deterioration. As deterioration starts, there is significant risk of the formation of mould spores and ultimately the possibility of heating to the point of spontaneous combustion. It is important to routinely monitor biomass in storage for any signs of deterioration and take corrective action immediately if needed. 2.3 Transportation of Biomass to Conversion Facilities Due to the low bulk density of biomass especially in chopped form, biomass must be sourced in a close radius to the conversion facility to minimize transportation costs. Bulk densities for chopped material can range from 70 kg/m3 to 120 kg/m3 while baled material can be 150 kg/m3 to 200 kg/m3. 2.3.1 Transportation Methods Possible methods of transporting biomass to the conversion facility include farm tractor and wagons, transport truck and trailer or in extremely high volume or long distances, by rail or by marine freighter. In all methods of transportation, volume would be the limiting factor, given the density of either chopped or baled biomass. Transportation by farm tractor and wagons would only be feasible if the distance from the farm gate to the conversion facility is 40 km or less. Beyond this distance, it is more economical for a farmer to hire a transport truck. Transportation by transport truck and trailer is likely to be the most common method. For baled material, either a flat bed trailer, flat bed B-trains or a walking floor van body trailer would be used. Capacities are shown in Table 2.6 for different trailers for both a standard density 1.2x0.9x2.3m (4x3x7.5ft) square bale weighing 420 kg and a high density bale with the same dimensions weighing 525 kg. For chopped material, a walking floor, van body trailer is most efficient and easily facilitates unloading. A 16.15 m (53 ft) trailer has up to 120 m3 in volume which translates into 8.4MT to 14.4 MT of biomass per load. Rail or marine would likely to be applicable modes of transportation only if the biomass was pelleted prior to transport to increase the bulk density. Constants assuming a bulk density of 120kg/m3 for various different transportation modes are found in Table 2.7. As an example, the calculated cost from the model to transport 14.4 DM tonne a total distance of 150 km by truck would be $377.84. This is inline with industry rates of $120 per hour for a truck and walking floor trailer as it would take approximately 3 hours to complete the above example including loading, driving and unloading time for a total cost of $360. Natural gas has been used in the transportation sector for many years; however, with the recent drop in natural gas rates compared to the equivalent energy costs of diesel fuel, many fleets are rapidly converting over to Natural Gas Vehicles (NGVs). NGVs offer significantly reduced fuel costs over diesel, with current market prices provided by Enbridge for compressed natural gas being $.70/L equivalent compared to diesel at $1.20/L (personal discussion with Enbridge sales rep). Thus, for trucks with high annual fuel consumption, significant savings are realized which quickly offset the higher capital costs of purchasing a NGV. Figure 2.5 illustrates the payback when buying a heavy or medium duty NGV over a diesel fuelled truck at various price differentials between natural gas equivalent and diesel. As an illustration, a NGV hauling 25 tonnes of biomass a distance of 150 km would expect a cost savings of $26.25, or $1.05 per tonne compared to a diesel fuelled truck. This is a significant cost savings given that biomass is a low value commodity. Additional environmental benefits result from reduced greenhouse gas emissions from NGVs. Gas Compressor and Quick-Fill CNG Storage System to fuel its farm service vehicles, in parallel with Natural Gas warming the family’s chicken barns, their home, and running approximately 100 essential appliances. must be designed to minimize the release or build up of dust into the process environment, and material handling equipment should have appropriate safety features such as explosion venting and spark suppression. These considerations will ensure that the biomass indeed is safe, reliable and consistent for the conversion process to operate efficiently. powered, live bottom (walking) floor trailer or dumped off using a regular dump trailer or a trailer tipper. Examples of these are shown in Figure 2.6, Figure 2.7, and Figure 2.8. After being unloaded, material could be transferred using a wheeled loader or mechanical conveyors into either storage piles, silos, or onto a live bottom floor to act as storage, and/or a buffer before being introduced to the conversion process. When the biomass is delivered pre-shredded, consistency and quality of the biomass is more difficult to monitor and to manage. Additionally, when handled in bulk form, fugitive dust is released into the process environment and must be controlled to maintain safe operating conditions. 2.4.2 Baled Biomass Handling Biomass that is delivered in baled form can be unloaded and handled using a wheeled loader or a telehandler or an overhead crane system. Onsite storage of biomass would likely remain in baled form until introduced to the conversion process. To introduce the biomass into the conversion process, bales would be fed into a bale grinder or chipper such as shown in Figure 2.10. With proper consideration and design of an air take-away from the bale grinder, a negative pressure within the grinder minimizes any dust is generated and released into the process environment. Figure 2.9 displays the material handling systems at Drax Power in the UK, which is one of the largest biomass fired, power generation companies. Quality control checks can be performed on each bale, and further segregation or assimilation of the bales is possible to maintain consistency of the biomass feed into the process. Source identification and tracking is also more achievable when handling biomass in baled form. nergy has a significant effect on Ontario producers because it is a major input to agricultural production systems. High energy prices have led producers to have an intense interest in generating energy on their farms and in their communities as a means to offset costs and generate revenue. To assist Ontario’s producers, governments have supported the development of technologies that utilize non-traditional energy sources for the production of dispatchable energy and the sale of energy to the electrical grid. With the implementation of the Ontario Green Energy Act, Ontario producers are eager to participate in the energy market. Advice for producers on the use and optimization of emerging energy technologies is not readily available to date. Producers engaging and investing in these new technologies face challenges managing technological and financial risks. Many of these new energy production technologies are being rapidly developed and commercialized around the world. However, some technologies are being promoted as ready for market without proven success. ProGrid Evaluation Solutions was used as a tool to assess the commercial and technical viabilities of the technologies and to recommend the most feasible technologies to monitor in the next 5 to 10 years. The ProGrid methodology and software were used as tools along with others to determine the final technology recommendations. The ProGrid evaluation methodology allows for the assessment of the value of intangible assets to assist with the decision-making process (Bowman, 2005). The ProGrid methodology has been found to be useful to: • Provide fair and objective procurement practices • Identify innovative technologies and monitor development • Assess the effectiveness of practices • Establish and monitor long-range goals ProGrid’s flagship software program is GlobalEvaluator. Global Evaluator is a valuable tool that was used to assess each emerging alternative energy technology. The assessment results assisted with the identification of the most feasible technologies that are almost ready for implementation on farms and in rural communities and with technologies that are likely to be ready for large-scale implementation within 5 to 10 years. 3.4 The ProGrid Evaluation Process The ProGrid methodology is comprised of 5 main steps (Bowman, 2005), shown in Figure 3.1. Figure 3.1 The ProGrid Methodology The methodology follows a sequence of evaluation steps. First, the main objectives must be identified. These objectives are called the “Overarching Objectives”, the two factors involved in the decision, and required for success. Next, an Evaluation Matrix is created, which contains all the criteria for the evaluation of the technologies. The Language Ladders are developed using the Evaluation Matrix and are a series of progressive statements that represent levels of expectation. A team of evaluators assess each technology using the Language Ladders and the results of the assessment are graphically represented on a grid. 3.4.1 The Overarching Objectives Many decisions involve two overarching factors or objectives, each of which may appear to be in conflict or opposition. A strength of ProGrid is the ability to consider the effect of two independent objectives on the final outcome (Bowman, 2005). The Overarching Objectives represent the x and y axes of the final Evaluation Grid. • Agricultural Fit: the suitability of the technology for the agricultural setting. • Technology Maturity: the development stage of the technology. • Complete System: the existence of a full process of operations to support the technology from biomass harvest to energy use. 3.4.2 The Evaluation Matrix The Evaluation Matrix is the backbone for evaluating intangible assets and contains the evaluation criteria. It is generally presented as a table with 3 columns. The Overarching Objectives are shown as the headings of the first and third columns. Criteria that support the Overarching Objectives are listed in the appropriate columns, with criteria influencing both Overarching Objectives listed in the second column. The criteria which affect both Overarching Objectives are called Enablers (Bowman, 2005). The Evaluation Matrix for the alternative energy technologies is presented in Table 3.1. All these criteria are important for the adoption of alternative technologies on farms and in rural communities. The Overarching Objective of Commercial Strength is supported by 3 criteria that include: • Energy Production: the amount of energy generated the final useable form, as well as dispatchability and reliability. • Co-Products Production: the production of additional products to energy or fuel. • Value Chain: the degree of participation by producers in the production, marketing and sale of energy and products. Three criteria that support both the Technical Strength and Commercial Strength Overarching Objectives are referred to as Enablers and include: • Financing: the availability of funds to implement the technology. • Skilled Labour: the availability of skilled individuals to operate the process. • Infrastructure: the compatibility of the technology or process with existing farm and rural operations, and infrastructure. the agriculture and energy fields. The ideal results of implementing the alternative energy technologies were determined, and the various stages of development and implementation were identified. Governments are willing to provide subsidies and support. Financial institutions are willing to provide funding in the form of loans. ... AND there is affordability in every step of the value chain with minimal waste at any stage. Fits with the biomass feedstock available for use in the energy generation systems (the available feedstock can be sourced from the field or are a co-product from a process). ... AND will ensure sustainability of farm land by producing co-products that can be returned to the soil to maintain the threshold value of soil organic matter. Workers must be brought in to operate the systems. Workers are available and specialized training is required. ... AND these workers have agricultural experience. An emerging technology at the research and development stage. Proven at the demonstration-scale with the use of a variety of feedstock. ... AND is modular and can be rapidly transferred/duplicated for implementation over a wide area. Installation competes with other land uses. Requires specialized farm buildings or equipment (biomass handling), some of which are in place. ... AND the technology generates products (energy and/or co-products) that can be used in Ontario and exported. Requires supporting units and processes which have not yet been developed. Results in a neutral or small positive energy balance. ... AND allows for energy storage. ... THAT can be stored or rapidly dispatched depending on the supply and demand. of higher expectation, until all expectations are exceeded (“D”). There is a Language Ladder for each of the criteria of the Evaluation Matrix (Bowman, 2005). Co-products that do not yet have a use. Useful co-products that can generate revenue if markets existed. ... AND that can be used as a soil amendment to improve crop production and contributes to sustainability. ... AND market and sell the value-added products. 3.4.4 The Evaluation of Technologies Experts in the energy and technology fields were invited to evaluate the technologies listed in section 3.2. The ProGrid software creates evaluation forms containing the Language Ladders. These evaluation forms are distributed to the evaluation team. An evaluation form is completed by each member of the evaluation team for each technology. The evaluation input is analysed by ProGrid and presented graphically. 3.4.5 Establishment of the Grid The results of an evaluation can be shown in the form of an Evaluation Grid with the Overarching Objectives as the axes. The Evaluation Grid for the alternative technologies is shown in Figure 3.2. The x and y axes are the Overarching Objectives. The evaluation result of each alternative technology is represented by a grey circle on the chart. A circle in the top right quadrant indicates that the technology has received high technical and commercial strength ratings and suggests that the technology is nearly ready for implementation. A. # C. D. E. F. G.
K. L. M. N. O. P. Q. R. S. T.
Figure 3.2 The Alternative Technologies Evaluation Grid A circle in the bottom left quadrant indicates low technical and commercial strength rankings and suggests that the technology is in the early stages of development. A high technical strength and low commercial strength (upper left quadrant) result indicates that there is a high commercial risk associated with the technology. A high commercial strength and low technical strength (bottom right quadrant) result suggests that there is a high technical risk associated with the technology. During the evaluation, the focus was on energy and fuel production. It is important to note that these technologies were evaluated based on the use of biomass as a feedstock to produce energy or fuels and not for the production of chemicals. There is much interest in torrefaction technologies, and production facilities have been constructed in Europe. A major strength of the torrefaction technology is the production of fuel. Major weaknesses identified by the evaluators were the lack of maturity of the technology (process flow for variable particle sizes from agricultural biomass) and the ability to acquire financing. There are very few commercial torrefaction plants in operation; however, torrefaction provides for the inexpensive storage of biomass feedstock and produces a dispatchable fuel. Microturbines are a mature technology with strengths in energy production and the potential for producers to participate in the value chain. Microturbines will likely require skilled labour for operation and may be unsuitable for all agricultural settings. Also, microturbines do not produce co-products for the generation of additional revenue. Small-Scale Batteries were identified as a feasible technology due to the maturity of the technology, the production of energy, and the participation of producers in the value chain. Weaknesses identified were unsuitability to the agricultural setting, the acquisition of financing and the lack of co-product production. Although there are challenges associated with these five technologies, many of these challenges can be overcome within the next 5 to 10 years. It is expected that with continued technology development, these technologies will progress through the commercialization process and become feasible for producers to implement on the farm and in rural communities. The Evaluation Grid presents the results of the assessments. It shows that the technologies that are currently the most feasible for use on farms or in rural communities include Direct Combustion, Gas-Fired Boiler, Anaerobic Digestion, Biodiesel and Bioethanol production. These technologies are represented by grey circles in the top right quadrant, close to the “Ready for Implementation” arc. These technologies are expected to be ready for large-scale implementation for the production of energy from biomass on farms or in rural communities in the near-term. the production of energy, whereas the main weakness of the technology is with regards to the acquisition of financing. here are a number of bio-energy technologies being developed around the world searching for greater efficiencies of energy conversion, increased ability to process diverse feedstock, lower production costs, improved reliability of operation, etc. Based on the current intensity of global research and development activities and the characteristics of energy sector in Ontario, the evaluation panel identify pyrolysis, gasification, torrefaction, smallscale energy storage and micro-turbine as emerging technologies. These technologies could be employed significantly once their technical and commercial strengths improve in the evolving energy sector in Ontario. However, it should be noted that it is not easy to predict the timeframe for the commercialization of these technologies. 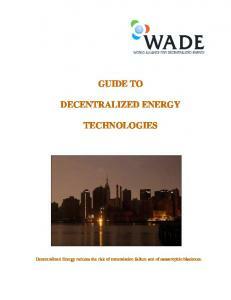 In this chapter, technical details of these selected emerging technologies are discussed. increasing the residence time. A simple schematic of a pyrolysis process is shown in Figure 4.1. Pyrolysis technologies are often named based on the types of the reactor or how biomass feedstock is moved in the reactor. The pyrolysis technologies, therefore, include fixed bed, auger, ablative, rotating cone, fluidized bed, circulating fluidized bed and vacuum. A particular technology usually works well for some types of biomass at a range of particle size. A sample mass and energy balance of a pyrolysis process is shown in Figure 4.2 (adapted from Manganaro et al., 2011 and Mullen et al, 2010). Enthalpy is the measure of total energy, and enthalpy rate is the flow of energy at a given point in Figure 4.2. Approximately 30 – 35 % of energy contained in biomass feedstock is consumed in the entire pyrolysis process. Typical chemical compositions of pyrolysis products are shown in Figure 4.3 for corn stover. The Canadian companies actively developing pyrolysis technologies are Advanced Biorefinery Inc., Agri-Therm, Alterna, Dynamotive, Ensyn/Envergent, Pyrovac, RTI and Titan. stability of bio-oil, lowering the acidity of bio-oil, and development of bio-char products. Bio-char could be potentially used to improve the soil quality; therefore, pyrolyis is quite suitable for the agricultural sector once it is commercialized. 4.2 Gasification Gasification is a thermo-chemical process in which biomass is mainly transformed into a mixture of combustible gases. In this process, biomass is heated to a high temperature of approximately 850 °C without combustion with a controlled amount of oxygen or steam. The resulting mixture of gases, called syngas, can be burned in gas engines or can be potentially refined to produce speciality chemicals or transportation liquid fuels. Gasification was developed over 150 years ago and was the prominent technology to generate energy from coal and forestry biomass. Stringent environmental regulations and competition from natural gas have made biomass gasification less attractive alternative at present. A schematic of biomass/coal gasification is shown in Figure 4.4. 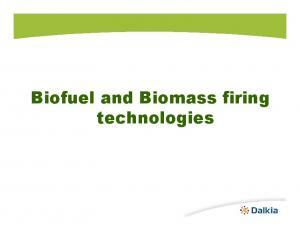 Report "Alternative Technologies to Transform Biomass into Energy"